入学要求：Applicants should normally hold a Bachelors degree (UK 2:2 or above) or equivalent qualification from a recognised British or overseas university.Relevant work experience could be an additional benefit where applicants have not reached the standard entry requirements, although it is not an admissions requirement for this particular degree programme. 入学要求：Applicants should normally hold a Bachelors degree (UK 2:2 or above) or equivalent qualification from a recognised British or overseas university. Relevant work experience could be an additional benefit where applicants have not reached the standard entry requirements, although it is not an admissions requirement for this particular degree programme. 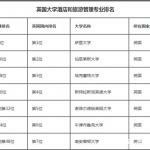 入学要求：A Bachelors Honours degree with 2:2 in any subject, or equivalent. 入学要求：A minimum of a second class honours degree (2:2) in business, hotel, tourism and management (or equivalent) plus at least one year's work experience in the hotel and tourism industry. Entry will also be subject to two satisfactory references (one of these must be an academic reference). 入学要求：Normally an honours degree or recognised equivalent qualification. We welcome enquiries from those who have substantial management experience but who do not have the normal entry requirements. We may invite you for an interview to discuss your particular background, experience and qualifications. You may also be able to claim credit points which can reduce the amount of time it takes to complete your qualification at Sheffield Hallam.